Anti-racism education charity pays tribute to its supporters at prestigious event in the Houses of Parliament. The fight against racism is far from over and Show Racism the Red Card will continue to deliver anti-racism education to young people and adults throughout the UK with the support of friends from within education, the Trade Union movement and the wider footballing family, as well as countless individuals whose contributions are essential in challenging racism and encouraging the rejection of hatred. Earlier this week, Show Racism the Red Card held a special 20th Anniversary celebration and Hall of Fame event at the Speaker's Residence, Houses of Parliament at the invitation of the Rt. Hon. John Bercow MP, Speaker of the House. The event combined a review 20 years of anti-racism campaigning, a commitment to continuing to challenge racism and prejudice in society, and an award ceremony to induct supporters, patrons and sponsors of Show Racism the Red Card (SRtRC) into the Hall of Fame under five different categories. Mr Speaker opened the event by paying tribute to the Show Racism the Red Card campaign, highlighting the contributions of several individuals in the room and lauding the unifying power of football as a force for change. He then introduced the evening’s compares; former Chelsea FC & Southampton FC centre back Ken Monkou & TV personality Lisa Rogers; both of whom are patrons of the charity. The immense contribution of Trade Unions was recognised by the ‘Trade Union Supporters’ category with Dave Anderson MP, Unite the Union figurehead Len McCluskey, UNISON’s Northern Region Secretary Clare Williams and North West TUC Regional Secretary Lynn Collins all receiving awards. SRtRC also lauded the contributions of a number of key individuals, with Jenine Abdo, Ali Abdi, Stephen Cavalier, and Norma Stephenson OBE all receiving awards in the ‘Campaign Supporters’ category. A number of Football Clubs & Managers were honoured at the event with Liverpool FC, Rotherham United FC, Southend United FC & Arsenal FC manager Arsene Wenger OBE receiving awards. ‘Current & former professional footballers’ including Brighton & Hove Albion’s Liam Rosenior, former England & Rangers striker Mark Hateley, former Wales & Swansea City midfielder Steve Jenkins, former Wimbledon FC winger Lionel Morgan, former Reading FC defender Francis Duku & former Wimbledon FC winger and current Sunderland Ladies manager Carlton Fairweather also had their contributions to the anti-racism campaign recognised. For their 'Commitment to Education', SRtRC honoured the Vale of Glamorgan Council, Herts for Learning’s Noah Kaindama, Buckinghamshire County Council’s Yvette Thomas and Show Racism the Red Card Education Worker Manisha Tailor. A wide variety of guest presenters helped to induct new Hall of Fame members including former England & Manchester City winger Trevor Sinclair, former England & West Ham United striker Bobby Zamora and former West Ham United & Charlton manager Alan Curbishley. The event was attended by many existing Hall of Fame members including former Wimbledon FC & Nottingham Forest manager Dave Bassett, former Coventry City FC winger Dave Bennett, former NUT General Secretary & Vice president of SRtRC Christine Blower and former Wales Rugby captain Colin Charvis. Also present were Hall of Famers including former Arsenal FC midfielder Paul Davis, former Aston Villa, Celtic & Chelsea defender Paul Elliot CBE, FIFPro Vice President Tony Higgins, John Hudson and Simone Pound from the PFA, Frasier Wishart, General Secretary of the Scottish Football Association and TV personality, patron and friend of the campaign Lisa Rogers. Completing the Hall of Fame line-up was former West Ham United & England winger Trevor Sinclair, UNISON Deputy General Secretary Liz Snape, former Nigerian international footballer Efe Sodje and Chief Executive of the PFA Gordon Taylor OBE. “This is Show Racism the Red Card's 4th Hall of Fame event in the charity’s 20 year History and we were delighted to be returning to the Speaker's Residence at the invitation of Rt. Hon. 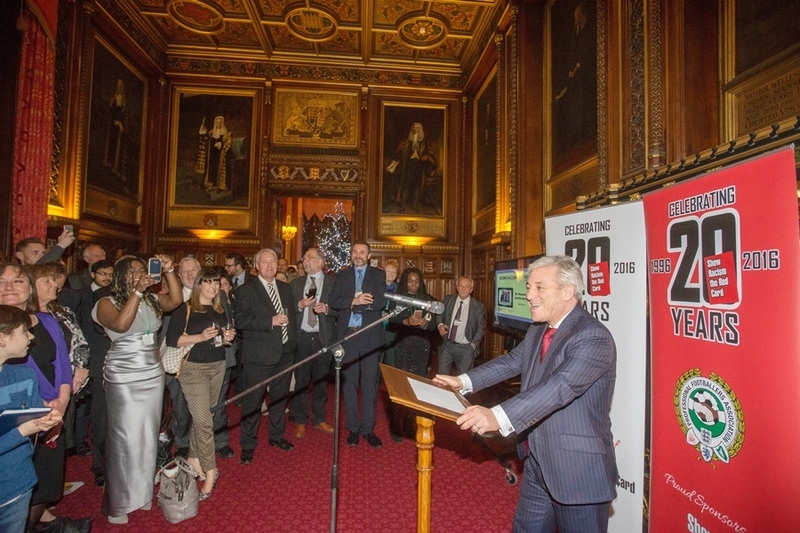 John Bercow MP for this year's ceremony, having held the 3rd Hall of Fame ceremony in the same venue three years ago." A gallery of images from Show Racism the Red Card 20th Anniversary Celebration and 2016 Hall of Fame event can be viewed via SRtRC’s Facebook page. Our thanks to Mark Thomas for photography. Show Racism the Red Card would like to thank the Right Honourable John Bercow MP for hosting tonight’s event and the PFA, Thompsons Solicitors and Ladbrokes Coral Group for their sponsorship. Thanks also to all of those who attended the event, particularly those who have supported the organisation throughout its 20 year history.